We should know better. We really should. 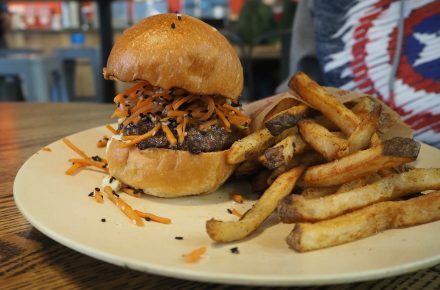 When an otherwise excellent restaurant offers an afterthought burger on the menu, skip it. We’ve learned that the hard way too many times. 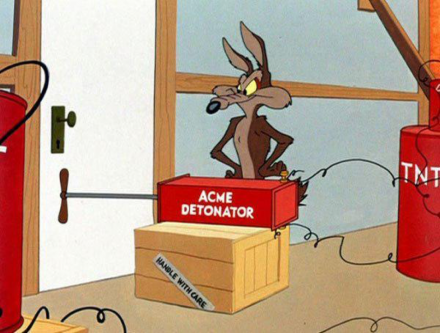 But, like Wile E. Coyote, we were drawn to Acme. We couldn’t help ourselves. It seemed so promising. And like the coyote, we were doomed to disappointment. 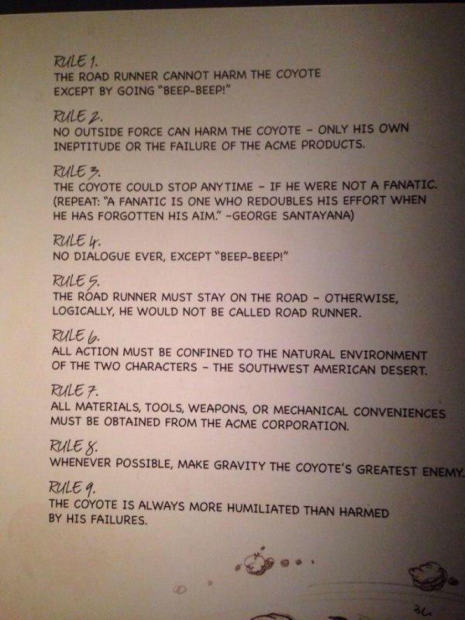 Chuck Jones’s rules for the roadrunner & coyote from his 1999 autobiography Chuck Amuck: The Life and Times of an Animated Cartoonist. We broke rule #3 first. We are indeed fanatics. We cannot stop. If there’s a burger around, we’ll try it, even when we know better. Then we fell prey to rule #2, the failure of the Acme products. What looked so good, so promising, especially in light of the other wonderful items on the menu, just left us dangling over a cliff holding a small sign reading “Help!” before we plunged to our cartoon doom. 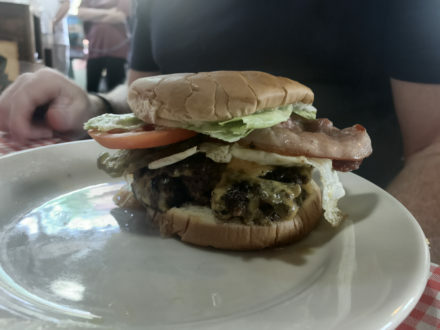 The Acme burger. Mine was a study in chronological disappointment, which is to say that the more time passed and the more I ate, the more disappointed I became. Meep meep, says the Road Runner. Burp…ugh….says I. The burger came out of the kitchen with some obvious glitches but no dealbreakers. The criss-cross bacon was not the ideal but it can work under certain circumstances. In hindsight, perhaps my over-hungry brain simply saw what it wanted to see. My first bite wasn’t bad! The meat itself tasted….mmmoookay. After the next bite and the bite after that, it became clear that the burger build was atrocious and the bacon gummed up the works. By the end, I was viewing the greasy mess of what was a burger on my plate with disgust and not a little bit of self-loathing. 2 out of 5. 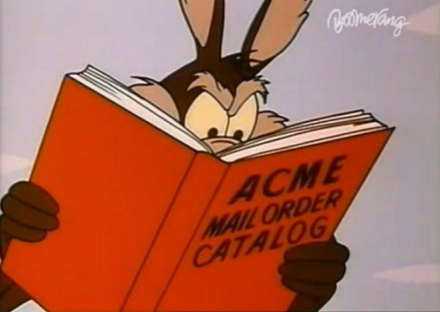 I have a feeling that the Acme burger is what would end up happening if the Coyote actually caught the Road Runner. Wile E. Coyote has spent his life in constant pursuit of that scrawny bird. Why? Is all that effort worth what minuscule meat is on those bones? I mean, they weigh about a pound on the high end. Even if it is not about the meal but a Captain Ahab-like pursuit of this creature, what next? Wile E. is left to wander the desert cleaning up the wreckage of his myriad of Acme contraptions remembering what once was. Such was our experience at Acme. There was a lot of build up because the food there is outstanding. However, once I got my hands on the burger. It was a real disappointment. The stringy bacon was haphazardly placed on the over-cooked patty. The beef had decent flavor but nothing outstanding. The cheese fused the patty and the bacon together which made rebuilding a disaster. Acme is a terrific restaurant with a less than average burger. They should do themselves a favor and just take it off the menu. 2.5 out of 5. Nope. Just, nope. We did indeed run afoul of rule #2. The Acme product failed us badly. The burger was overcooked and underseasoned. The bacon was limp. The cheese was bland. All of the wonderful promise disintegrated before my eyes and I was left wondering how it could have gone so, so wrong. 2.5 out of 5. I’ve always just seen it as late breakfast with the option of enjoying an alcoholic beverage guilt-free. If you have bacon and eggs with Bloody Mary at 8:00 AM, you are a drunk. If you have the same meal at 11:30 AM, you’re having brunch. Eating a burger for breakfast strikes me the same way. Burgers have been relegated to lunch and dinner. Big Ed’s throws that notion out the window. They have a Deluxe Hamburger and a Deluxe Cheeseburger right along side the biscuits and French toast. It was seven ounces of juicy goodness. 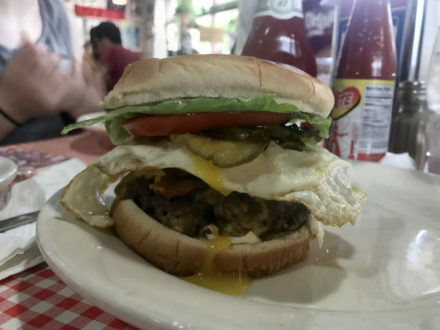 I had mine with lettuce, tomato, pickles, mayo, and an over-easy egg. The patty was a touch over done. The server offered to have them make it over again, but I was already halfway done. The build was perfect. The bacon was broken on top in half-strips so as to maximize the flavor experience. Everything was cooked on the griddle including the bun. If the patty was cooked medium as I ordered it, we’d have a new number one on our hands. However, to be fair, I have to dock them a quarter point. I give it a 4.75 with a strong recommendation to get it with a cup of coffee the next time you are in downtown Raleigh for brunch. Don’s take: I am ashamed. I have let you down. I have let myself down. I have lived in Raleigh for the past 25 years and I have gone to Big Ed’s in City Market more times than I can count. And I have lived a lie. I have had their pancakes, their biscuits, their bacon, their eggs, but I have never had a burger until that day. And on that day, I cried. All the opportunities missed. All the burgers forsaken. I beg you to not make the same mistake, look past the breakfast options and go for the burger. After all, you can add country ham and a perfect over medium egg on that burger and have it all, like I did. I ordered the burger medium deluxe style, plus ham and egg.. The only thing that was wrong in this burger was that it was just slightly overcooked, like Michael’s. The patty was delectable with a nice sprinkle of char; the lettuce- crisp, the tomato- robust. Ed’s country ham combined with the perfectly cooked egg was that little taste of heaven that we rarely get the chance to have. I give the burger a 4.75 and know that it will hit the golden 5.0 the next time I go back. Big Ed’s City Market Restaurant: 4.75 out of 5. Ranking 6 out of 74. Chad got there early. Despite the fact that the restaurant was 90% empty, he was denied a table. The hostess would not seat him until the full party had arrived. He had to go sit in the corner. Literally sit in the corner on a lonely metal chair. They might as well have given him a dunce cap. 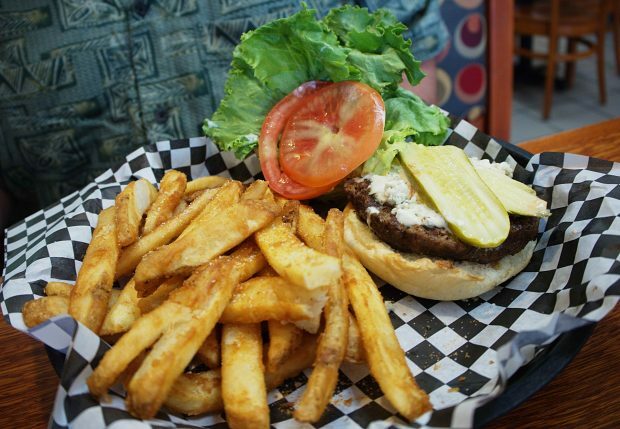 “Chuck’s has changed its burger formula. As I recall, they used to feature 1/3lb burgers, the perfect size (or at least gave you an option). The burgers at Chucks are now 1/4lb, which is fine if you like medium to medium well. I ordered mine medium rare. 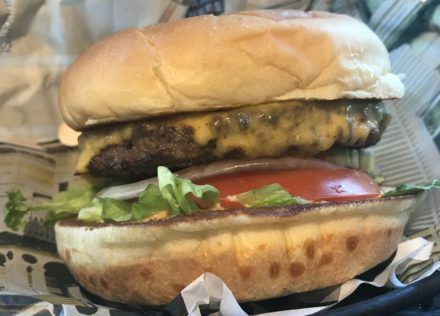 That’s a tricky temperature for a thinner patty, but I expected the grill cooks at Chuck’s to be able to pull it off, as they are among the best in the Triangle. They didn’t. I got an overcooked, underseasoned burger. We generally don’t let atmosphere or sides influence our burger ratings. I’m going to make an exception here. I was not happy about sitting alone in the corner while the few patrons who were there wondered what I had done wrong, but I can deal with that. When Micheal showed up, the hostess did indeed show us to one of the many empty tables before Don arrived. That was nice. But the the other element that should not be influencing my feelings about Chuck’s (but is) are the fries. I haven’t been there in a while, but the last couple of times I’ve been to Chuck’s the fries have been plentiful and perfectly crafted. This time the side order of fries was skimpy and had clearly only been fried once rather than twice, which is standard restaurant practice to achieve a crispy outside and fluffy, potato-y interior. These were like the fries my mom used to make in her Fry Daddy — too brown on the outside and mushy on the inside. * Extra points if you get the “Dirty Dancing” reference. Michael arrived to find Chad sitting at his place in the corner. He walked past no less than 8 empty tables to be told that we wouldn’t be seated until everyone in their was party was there. 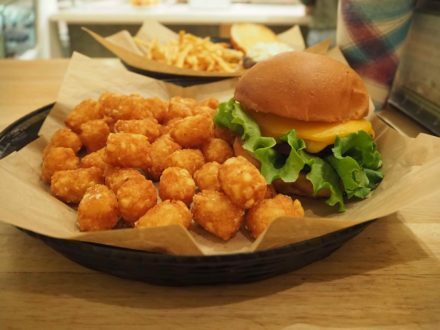 “The thing that really disappoints me about the Chuck’s burger is how good it used to be. I think I would give it a pass with something like a 4.00, if this is the first time I had eaten this burger. It used to be the pinnacle of burger establishments. 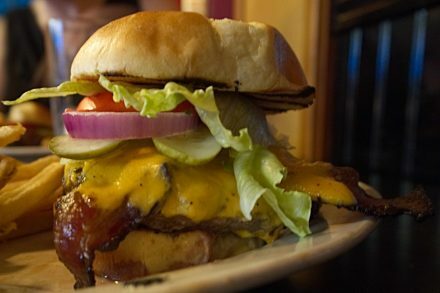 When people would ask me about my favorite burger, I would tell them it was at Chucks. Alas, The Spirt Animal is no longer the best burger in the Triangle. It is not even the best burger in downtown Raleigh. The care that was taken at Chucks originally set it apart. This burger was thrown together hastily. Gone are the perfectly-sized 5 oz and 8 oz patties. Replaced by a too small 4 oz and a too-thick double to replace the 8 oz. The Spirit Animal is described as having tortilla dust. The first time I had it, it was pulverized and mashed into the cream cheese. It gave a hint of tortilla flavor without any evidence it was there. On our re-review night, there was a solitary tortilla chip broken into 6-7 pieces on top of the cheese. The other toppings were below the patty making it a pathetic mess. Below. The. Patty. I may sound harsh in this review for something that, honestly, is decent. This used to be a 5.0 burger. The burger against which all other burgers were based. Now it is an uninspiring place that is more about flare than flavor. Don was nostalgic for better days. “There comes a time when your greatness causes complacency – like a middle-aged burger reviewer who once could spin words into gold, comedy gold, but now can barely string two words together with a hyphen. Unfortunately, Chuck’s is struggling with this now. There was a time when I would fast in the morning and gladly schedule my time where I could be there at 11:45 am to beat the lunch rush just to get that fresh juicy love in my stomach. It was special, it was our best. But alas that time has past. And the worst thing I can say about is, ‘it has become ordinary’. A fairly good ordinary, but ordinary and unmemorable. I go my usual, ‘Bear in Heaven’ and it was nothing special. Unlike my com padres I don’t worry about atmosphere or fries, so my burger is my task and my task was uninspired. The ingredients played well together, but it had lost something- that “it” factor. 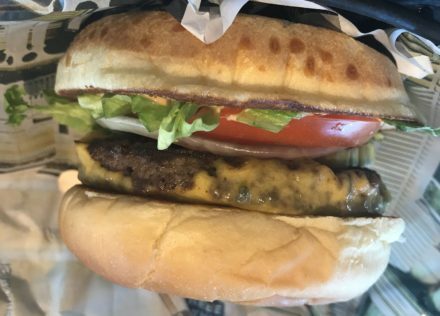 It has been mentioned before, but the lack of the bigger patties being replaced with thinner smaller patties really removes the juicy factor to the burger that made Chuck’s so special. After our re-review, Chuck’s falls from 1 to 15 out of 73. Carolyn has since been to Chuck’s since our visit described above. Is this a sign that Chuck’s has started to turn it around or a one off visit? Time will tell. If you want to deliver maximum happiness with a burger, how about having the burger be what you taste the most. They need to take a page out of Smashburger’s book and put the main flavor on the bottom. The only thing between the bottom bun and the patty is the seasoning. The theory is that the seasoning will touch the tongue first, and that will be the dominant flavor. 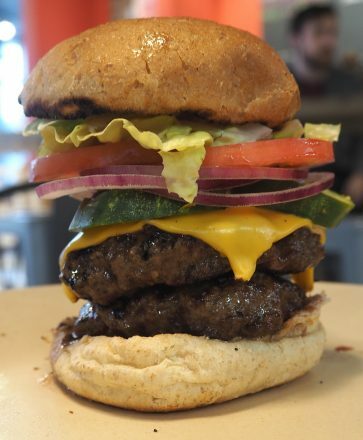 With the Our Burger, you get sauce (good), lettuce, tomato, onions, pickles, then the patty. This build is just wicked wrong. It’s a shame, too, because the patty was excellent. Excellent balance of char and flavor. I highly recommend heading to Wahlburgers if you have one near you. Just be prepared to take it apart and build it properly. My rating is a 3.75. It would have been a 4.75 if the build hadn’t been upside down. Happy new year burger lovers. You probably noticed that the content on TSB.com has been sporadic in 2016. I’ve been working on a new project with Burgiatrist Emeritus Scott (more on that to come.) Chad’s constantly working on other writing projects. He’s the only one of us that actually makes any money writing. Don is busy being a professor and with other design projects. Carolyn has a new baby. Unfortunately, writing about delicious burgers in the triangle has taken a back seat to everything else. Take heart, though, TSB will continue. We are still discovering new burger places, and we’re going back to old places to make sure they live up to TSB’s exacting standards. We’ll put up podcasts as subjects come to us. Just subscribe or follow us on Twitter to stay up to date. The one casualty of 2016 is the TSB app. It was simply too expensive and too much work to maintain. I looked at what it offered compared to the mobile version of the site, and it wasn’t much more. Basically, I was paying for the ability to search a map of our reviews. I have found a few options to add that to the mobile site. Look for that in the next month or so. That’s about all for now. We recently went to do a re-review of Chad’s favorite Salem Street Pub with a special guest. We also have a podcast to post soon. Thanks for your support over the years. We look forward to providing you with burger information and entertainment for years to come. These are the voyages of The Straight Beef. Our seven-year mission: to seek out new burgers and new toppings, to boldly go where … ah, screw it. Sometimes a burgiatrist is just tired of the adventure-burger of the week and wants something comfortable and predictable. We here at The Straight Beef are intrepid eaters. We’ll try just about anything once, even if it gives us the meat sweats, but sometimes we just want to go where everybody knows our name. Scratch that, we’re mixing classic TV metaphors. Sometimes we just want something we know is good, that we don’t have to think too hard about, and that isn’t too far away. For Chad, that’s the Salem Street Pub in Apex. For Michael, it’s William’s Gourmet Kitchen near the intersection of highway 55 and highway 54 in Durham. With Don in Prague for an international burgiatry conference and Carolyn on the DL, Michael and Chad sallied forth to William’s for a straightforward, no-nonsense great burger. Michael: I ordered the special burger of the day, the Bacon Lovers Burger — six strips of bacon, cheddar cheese, and bacon aioli. I know you’re thinking, “Six strips of bacon? That must have been a mess.” Au contraire. The strips were layered in both directions and held together with a generous amount of cheddar cheese. It was difficult to tell, but I bet they cooked the patty to medium rare, then put on a piece of cheddar cheese, carefully placed the bacon, added another piece of cheese and left it to cook under a lid for 30-45 seconds. It was too perfectly melted together to have been done any other way. The brioche bun was slathered with a bacon aioli. I’m not usually one for bacon stunts, but William’s nailed it. Smoky crisp bacon, loads of oozing cheese, a perfectly cooked patty. They were also thoughtful enough to not throw on the perfunctory lettuce, tomato, and onion. This burger was smoky salty goodness wrapped in a soft brioche bun that was more than up to the task of holding this monster together. Chad: Let’s get the obvious out of the way. William’s Gourmet Kitchen looks like a repurposed Wendy’s, but like Durham’s Only Burger, the plain looks belie the wonders therein. 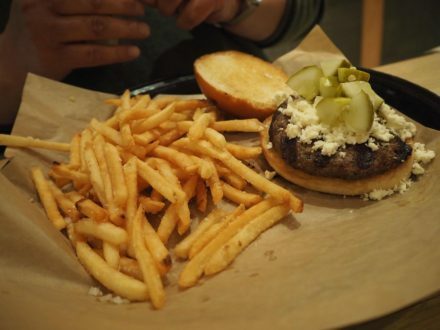 I ordered the Black & Blue Burger, a blackened-spiced patty with blue cheese crumbles, pickles and blue cheese dressing. I have some quibbles. The blackening spice, which should bring some New Orleans style Cajun heat to the party was not as present as I would have liked. It was a little tame. Likewise, the blue cheese barely registered on my palate. 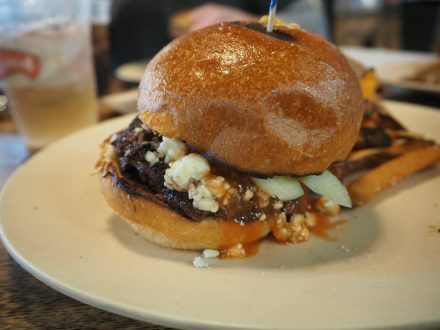 A blackened burger with blue cheese should be a flavor beast, a potent combination of spicy, salty goodness. This burger was much more subtle than that. On the other hand, the mild toppings really let the flavor of the patty shine through, and shine it did. This was a perfectly cooked, beefy hamburger that I’d rate as among the best in the Triangle. In my day job as a cookbook author, and in my alter ego as former burgiatry supervillain, I’ve eaten hundreds of burgers. I’ve probably cooked twice that many. 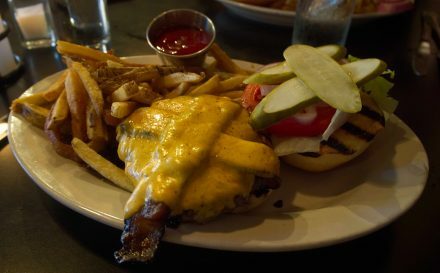 To the good folks at William’s Gourmet Kitchen I’ll say, that’s a damn fine burger. I wish I’d made it. Chad’s review: The Black & Blue Burger was a little tamer than I expected, but still an excellent burger. I give it a 4.5. Excuse me waiter, there aren’t any flies in my soup. Our eminent burgiatrists Donald and Michael discuss eating insects. A sea change to help our environment or an underhanded tactic by the Musroom Council. You decide. How many times have you said to yourself, “I could go for a burger.” Well, the media, backed by the people at the Mushroom Council, has come to demonize red meat. If burgers are so bad for us, we should make our times spent with them count. We shouldn’t just go to the nearest fast food place to satiate our desire for ground cow meat. 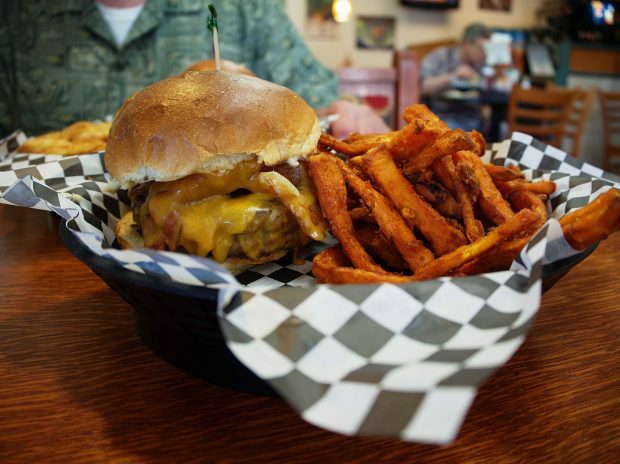 We should go to a place like Mojoe’s Burger Joint. A place that cares. A place that serves up consistent quality. 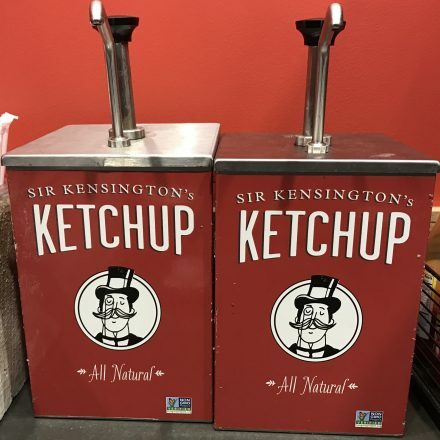 A place that uses the Keep It Simple Stupid method of burgering. A place that deserves to be TSB Certified. Michael’s rating: I knick them a bit for poor bacon placement. When in rarified air such as this, one has to nitpick. I give them a 4.75.